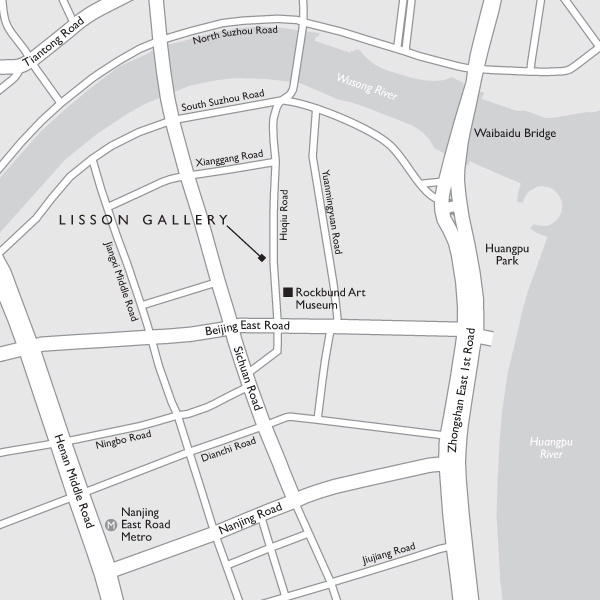 Lisson Gallery Shanghai will be housed within the former warehouse known as the ‘Amber Building’ on Huqiu Road. This historic building, dating back to the 1930s, was previously used during the Republican period by the Central Bank of China. The road, historically referred to as ‘Museum Road’ due to its location, today sits alongside some of the city’s major museums and cultural institutions, including the Rockbund Art Museum, Fosun Foundation and Christie’s. The newly launched Lisson Gallery Shanghai will open to the public on 22 March 2019. This will be the gallery’s fifth permanent exhibition space, joining two in London and two in New York. Lisson Gallery Shanghai will open with an exhibition entitled ‘Love is Metaphysical Gravity’. Taking its title from a quote by the American architect and theorist Buckminster Fuller, the exhibition will include works by Marina Abramović, Shirazeh Houshiary, Richard Long and Tatsuo Miyajima, tying together works that go beyond the physical realm of gravity, into the transcendental, mystical and metaphysical. Richard Long, an artist who has been in the vanguard of conceptual art in Britain since he created A Line Made by Walking over half a century ago in 1967, will present a recent China Clay painting, Untitled (2018) for the opening exhibition. Whether as thumbprints on driftwood, swaths over plywood or splashes across walls, Long has worked with liquid mud and various types of clay for many decades. These works are a manifestation of both the physical vigour with which the water and clay are applied, as well as the gravity that draws the material downwards in drips and splashes. Long reasserts control by containing these forces within a black border, capturing an elemental balance, with fluid marks that bridge tide and time, land and sea, here and there. By bringing raw matter from outside into the gallery, he posits an alternately ancient and contemporary relationship to the land, redolent of prehistoric monuments and current environmental concerns alike. Gravity and the body also play a key role in recent paintings by Shirazeh Houshiary. She investigates the friction between the conscious and unconscious, control and chance, reflecting on the physical and immaterial qualities that shape art and human life. Known for ethereal paintings, combining whirls of colour under a skein of precisely drawn pencil markings, her new paintings introduce elements of chance to her tightly controlled process. Mirage (2017) was created through the process of placing the canvas horizontally on the floor and flooding the surface with water and pigment. The pigment traces the haphazard journey the water has taken across the surface. From afar, the completed painting appears almost weightless, but upon closer inspection it reveals, in the words of curator Joachim Pissaro, a “monumental gravitas”. Accompanying the painting in the exhibition is a recent wall-based sculpture, titled Allegory of Sight (2015). Resembling a series of dancing ribbons or darting wavelengths, this cast stainless steel sculpture is coated in evanescent white paint and lit from above. These works explore the complex relationship between the interior and the exterior – between the skin and the body – manifesting permeability and flux through mercurial surface effects that resemble cosmological compositions beyond the realm of human experience. Working at the frontier between art and technology since the 1980s, the works of Tatsuo Miyajima employ contemporary materials such as electrical circuit boards, digital light-emitting diode (LED) counters and computer-controlled systems to create artificially intelligent ‘organisms’. Three principles represent the foundation of Miyajima’s art, which he outlines as ‘Keep Changing. Connect with Everything. Continue Forever’. His most recent series of work, Innumerable Life/Buddha (2018), is made up of redglowing LED displays, with thousands of numbers counting down from nine to one at differing speeds, before going dark momentarily. These digits embody the human cycle and the philosophy of change and renewal; each solitary, blinking diode signifying the individual body and soul. The counting sequence continues, as if everlasting, and yet ‘0’ – which would imply death – is expressed by darkness. Through this allusion, the numbers – or ‘Life’ – are destined to repeat an everlasting cycle of regeneration. This idea is also reflected in the colour of the new works: the radiant red of the installations denotes the blood of life, love, fire, passion, strength and joy. Since the beginning of her career in Belgrade during the early 1970s, Marina Abramović has pioneered performance as a visual art form. Her works marry concept with physicality, endurance with empathy, complicity with loss of control, passivity with danger and push the boundaries of self-discovery, both of herself and her audience. Her recent works are rooted in the need to “elevate the spirit of the audience” by sharing the energy of a heightened consciousness generated by long durational performance. The work featured in the opening exhibition, The Kitchen III from the series: The Kitchen, Homage to Saint Therese (2009) takes inspiration from the writings of Saint Theresa of Ávila, a 16th century nun who was said to have levitated in church and once while cooking. The work is also autobiographic in nature, drawing upon the artist’s own memories: “The kitchen was the place where [my grandmother] would tell me stories, and the kitchen was the place where all the secrets were told. It was a kind of place where the spiritual world and the daily world met and mixed.” The work prompts us to elevate our souls and to see the spiritual in our own daily, earthbound actions. Fifty years on from Fuller’s statement that ‘Love is Metaphysical Gravity’, the world appears more divided than ever. Houshiary says, “I’m interested in looking at the reason why we don’t see ourselves as part of the same story – even though each civilization is a layer of our story as humans.” The mystical nature of works by Abramović and Houshiary, as well as the transcendental qualities represented in the work of Miyajima and Long provide us with a common ground or language – a global message of togetherness, a necessity for humanity in order to face the challenges brought on by automation, scarcity of resource and environmental degradation. “As humans and living beings, we cannot and do not exist independently. We are only able to live within relationships in this world”, says Miyajima. Love is the cosmic element that binds us together.